Another half-million square feet of warehouse space was positively absorbed just over the past three months causing lease rates to slightly increase while the vacancy rate decreased to 7.5%. By comparison, the national vacancy rate is still roughly two percentage points higher at 9.3%. In our opinion, half of the properties that are available are either overpriced and/or have functional issues. Another concern of ours is that we are noticing that there are fewer, good functional properties coming available on the market for sale or lease (see Graph below). The musical chairs game is coming to an end; more companies are settling in. It is not uncommon for tenants to sign five and ten years lease terms with both new deals and renewals. Some prospective buyers and tenants continue to wait on the side lines for the perfect property to come available either on-the-market or off-the-market. Good brokers work their networks seeking future availabilities and “pocket listings” for their prospective buyers. The biggest news of the quarter was AEW Capital Management’s acquisition of Flagler Station Business Park in Medley for $340,000,000. The property consists of 4,200,000 sq. ft. of class A and B warehouse, office and retail spaces. The seller was FDG Flagler Station. Several warehouses in Americas Gateway Park were also sold to TA Associates Realty; the seller was RREEF. The portfolio consisted of about 252,000 sq. ft. for a sales price of $19,100,000 (or $75 psf). The other large sales transaction was Seagis’ acquisition of the UPS Warehouse, at 10000 NW 25th Street, in Doral. The 340,000 sq. ft. warehouse sold for $26,500,000 or about $78 psf. United Parcel Service sold the property since their logistics operations was downsized. The entire property is now available for lease. For a partial list of warehouses in Airport West Dade that were sold or leased, please see below. 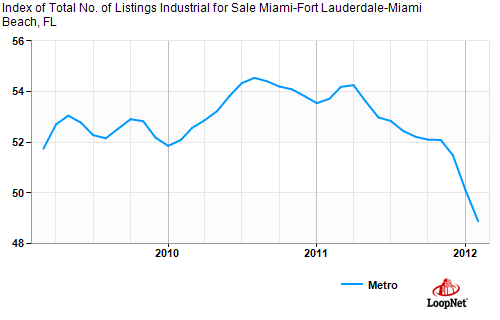 Notice that in this graph the index has fallen by about 10% over the past couple of years for industrial properties that are available for sale in South Florida. Good real estate is getting hard to find and more expensive. Warehouse: 25,000 to 40,000 sq. ft.
Land: minimum of 2 to 3 Acres, parking for 150 cars. Use: parking and maintenance of fleet cars. 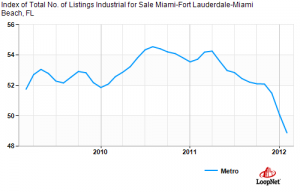 Location: Central to North Miami Dade; preferred close to Palmetto Expressway. Occupancy: 4th quarter of 2012.